We now get to the bit of the painting that I really made up as I went along. 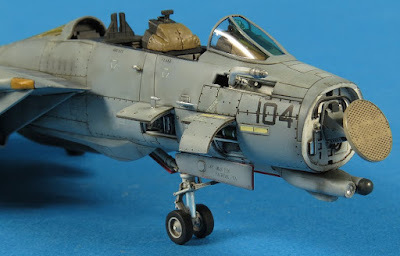 I have read many other modellers "methods" for weathering TPS US Navy jets and I tried to borrow any of the ones that made sense and add in my own ideas as I progressed. 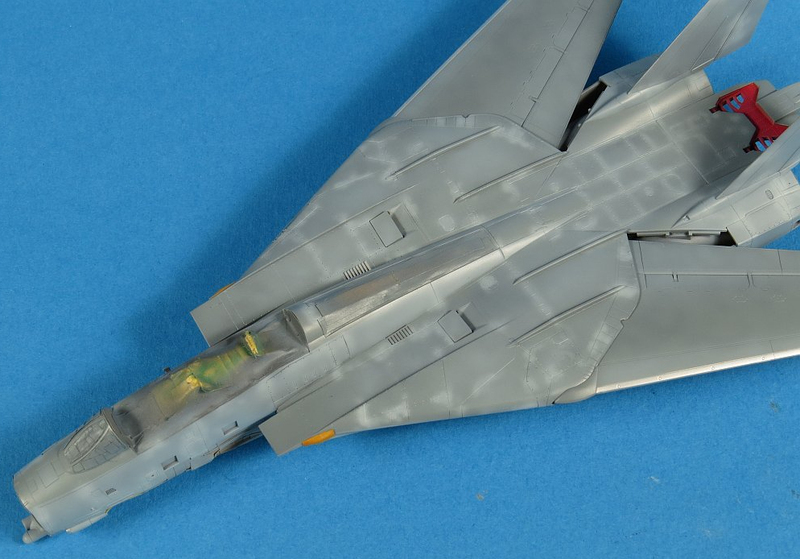 The thing that occurred to me as I studied F-14 photos was how the paint patches and touch-ups seemed to result in the F-14 surface appearing to fade in exactly the opposite way to a normal aircraft. 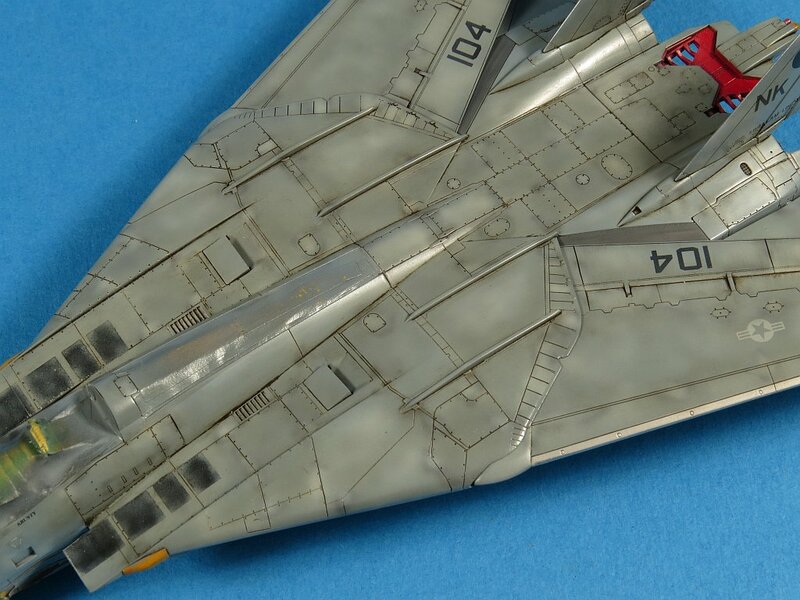 What I mean is that normally a panel fades in the middle and appears darker towards the edge (hence why many modellers use black to highlight the panel lines or edges of panels). 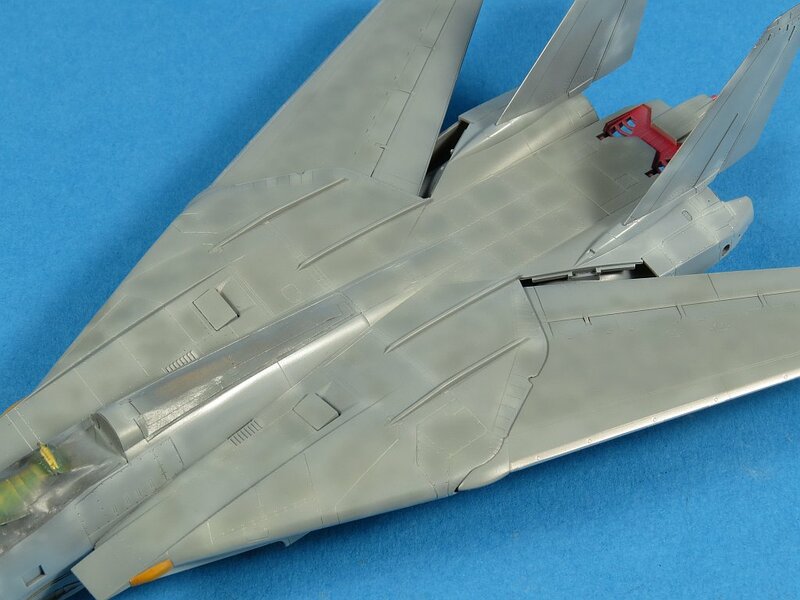 The F-14 seems to have darker shades of paint in the middle of panels and lighter on the edges, quite the reverse to normal. I believe this is because when they remove a panel and re-attach it for maintenance they apply fresh touch up paint over the join. This touch-up paint is newer and looks lighter than the older dirty paint. Anyway ... this is why my first shot was to go over the edges of the panels with a lightened grey as shown here. The result of the first pass was too stark a contrast between the light and dark sections. I addressed this by toning down the lighter patches but overspraying the whole surface with a very heavily thinned mix of the base grey. You can see the effect is still there (lighter panel edges, darker centres) but it does not immediately jump out at you like before. With most things related to weathering my approach is "less is more". 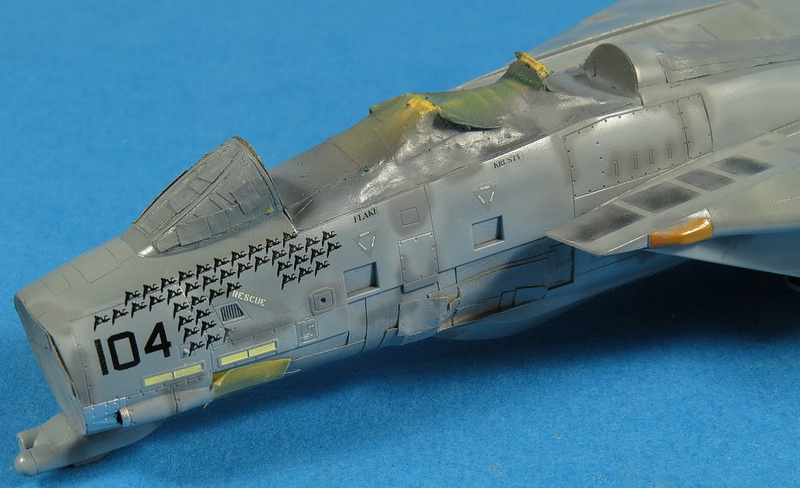 At this point, I decided that I need to apply the decals before doing any more paint work on the surface. Why? 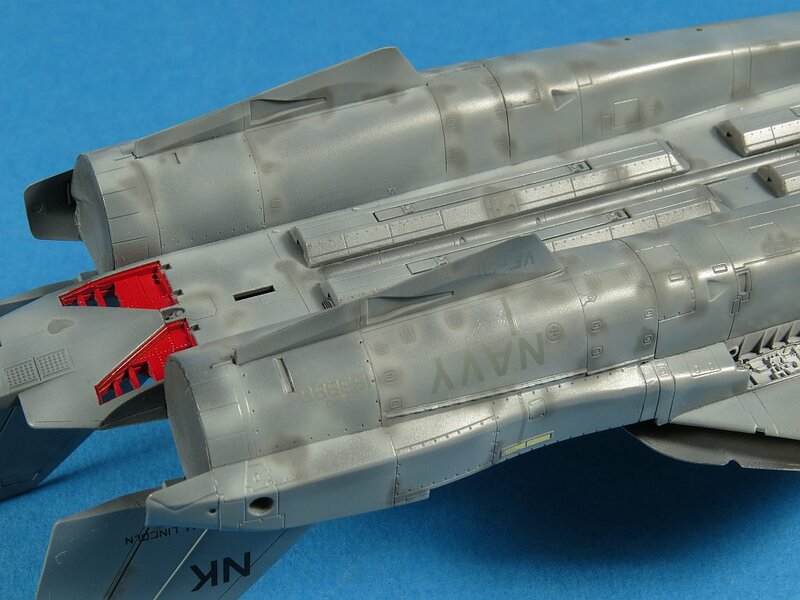 well, the touchups on the real thing often times result in overspray and degradation of the aircraft markings as well (no they don't mask them off). I wanted to capture this on my model. A quick coat of Future gloss, the TwoBobs decals (printed by MicroScale) performed perfectly (as always). 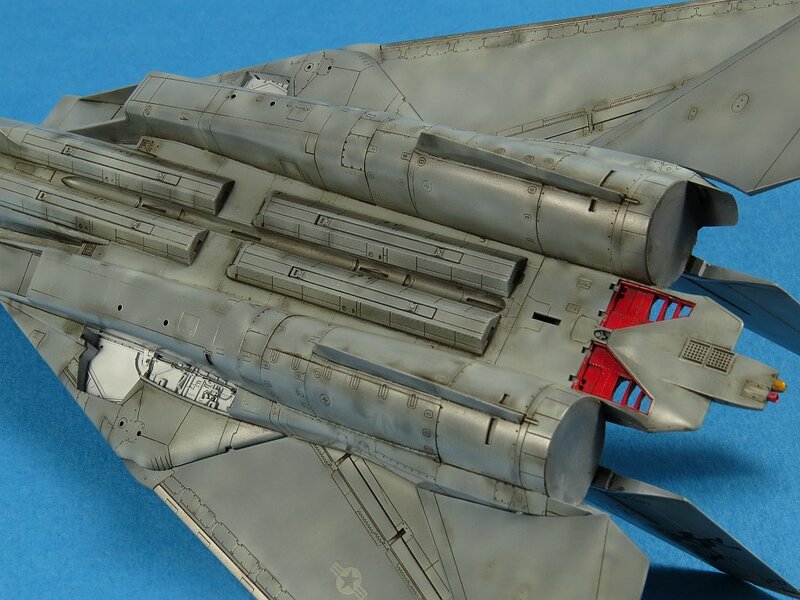 One decal I did not use was the walkway on the top of each intake. 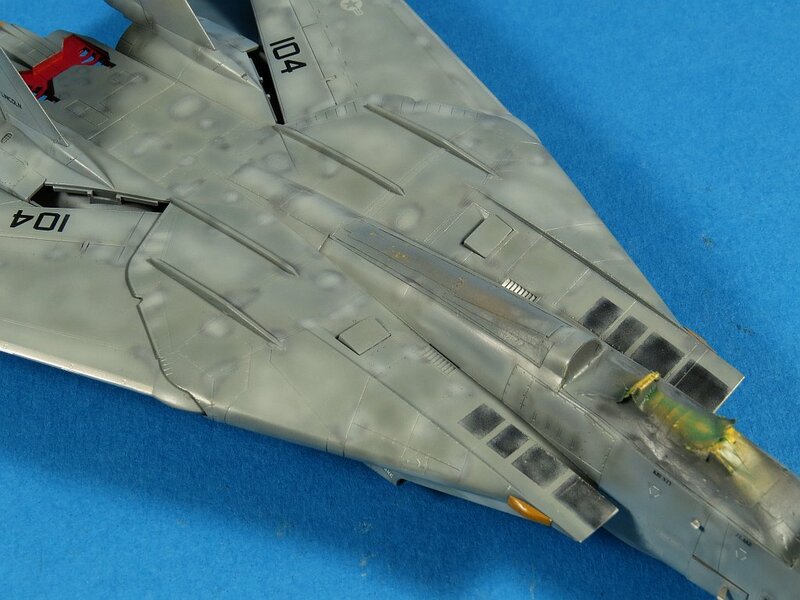 These are actually a non-slip raised roughened finish on the real F-14 and so I decided that a better solution than decals was needed (even in 1/72). I masked up the top of the intake (using photos and the decals as a guide) and sprayed (at a low pressure) some Mr Surfacer 1000 which resulted in a slightly rough, raised panel once the masking was removed. 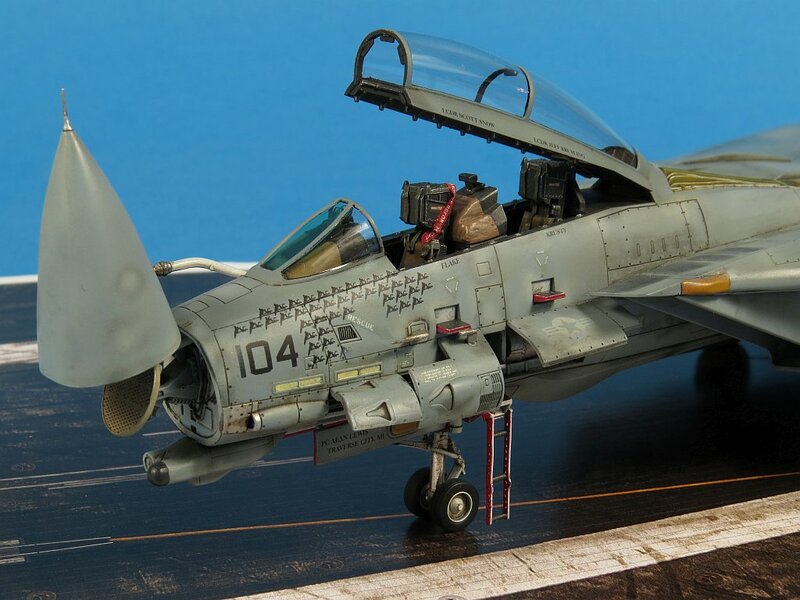 Using reference photos I went over the entire airframe and with a darker grey paint (Tamiya from memory) I spot painted access hatches and areas I figured would be subject to regular maintenance and hence touch up paint. The underside received quite a bit of attention in this step. 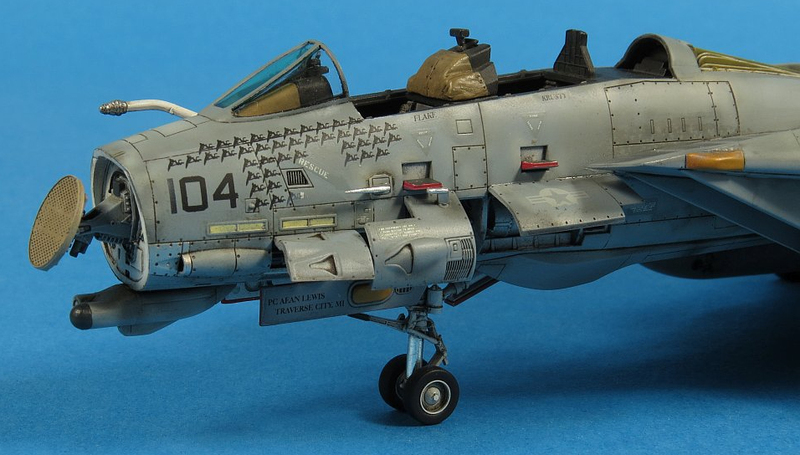 My decision to model aircraft 104 was completely arbitrary. 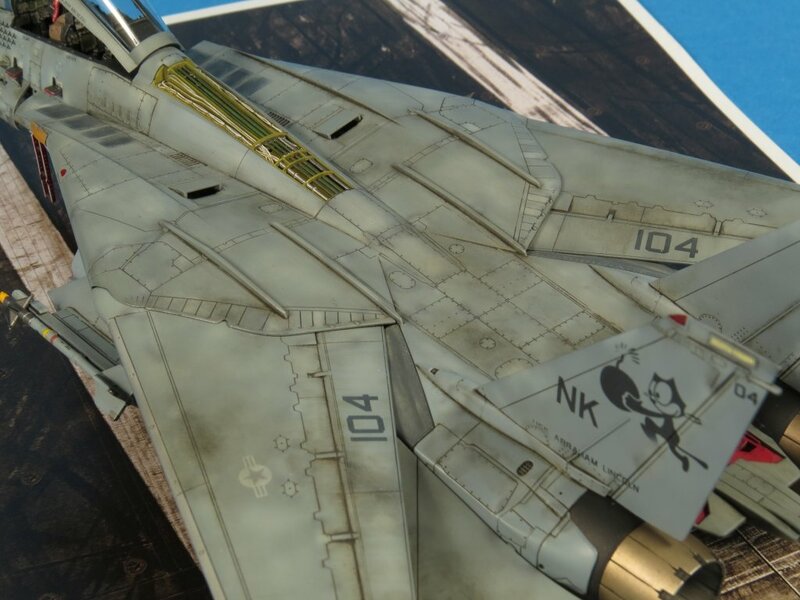 I just liked the way the mission markings surrounded the modex number on the nose (not very scientific I guess). My patch up airbrush work continued freehand with a low pressure to minimise the overspray (remembering this guy is pretty small in 1:72). 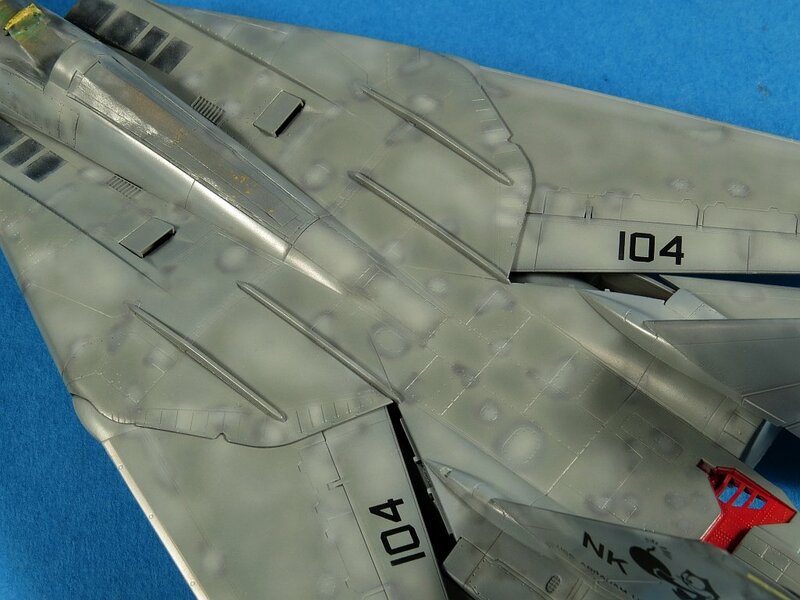 The last step in the weathering phase with my airbrush was to now once again go over all the touchups I hade done in the darker grey with an even lighter grey. 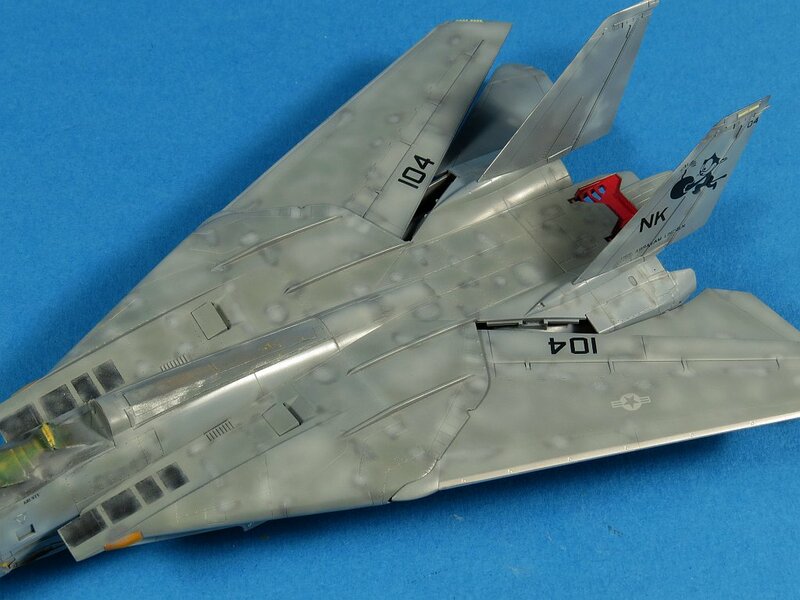 This was to give these final touchups a darker edge or shadow effect which I had observed on the real F-14. At this point, I started to feel like I was getting somewhere as the overall effect was looking very much like what I had imagined in my minds eye (and yes I breathed a sigh of relief). The overall "patchy" effect from another angle. The effect still looks overdone in these photos but remember with more weathering to come which will tone it down its best to be a bit over the top at this intermediate stage. A final view of the finished paint work. Next up, panel wash time. 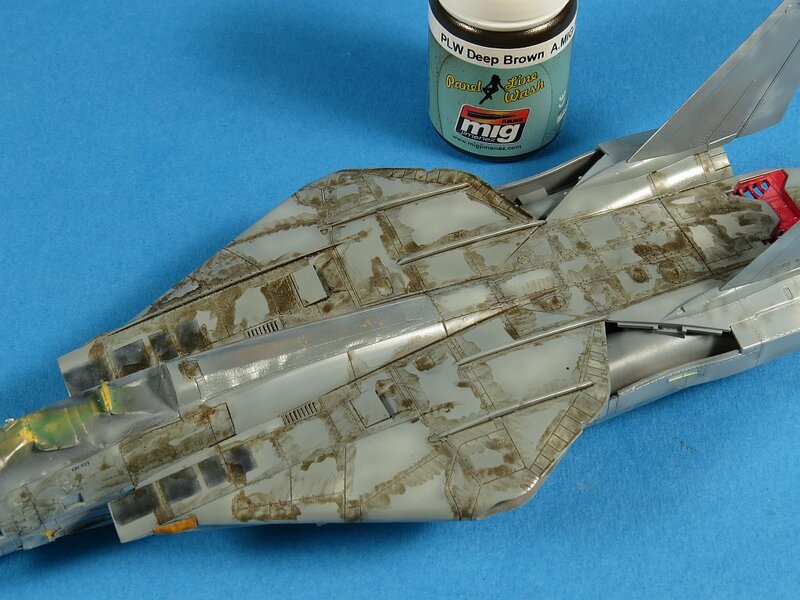 I've always made up my own panel wash, normally using Model Master enamel paints, but for this build, I had some of the new (well new to me) MiG Ammo pre-mixed panel washes on hand. I picked one that looked closest to my beloved Burnt Umber and laid it down straight from the bottle with a small brush. The wash performed very nicely, much like any wash, I would make up myself so I was quite happy. 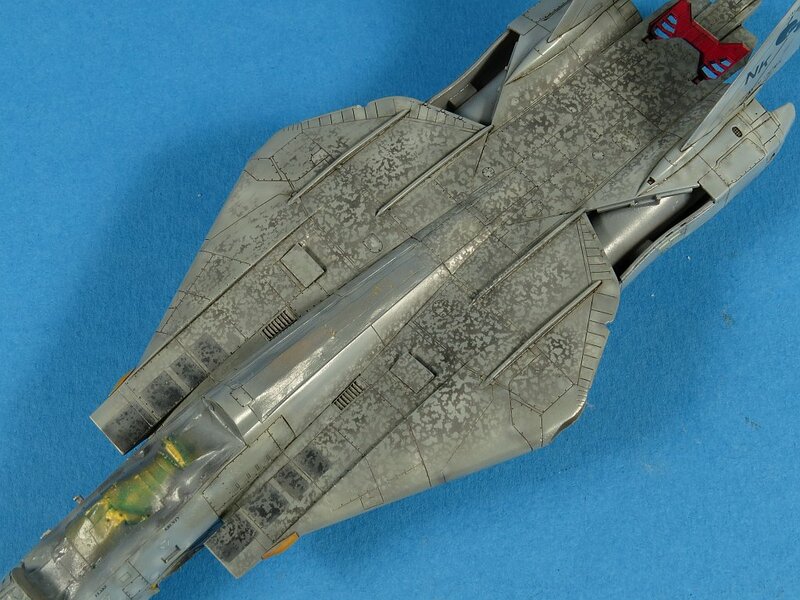 It may seem that I have used a lot of panel wash, probably more than is needed but that is intentional. 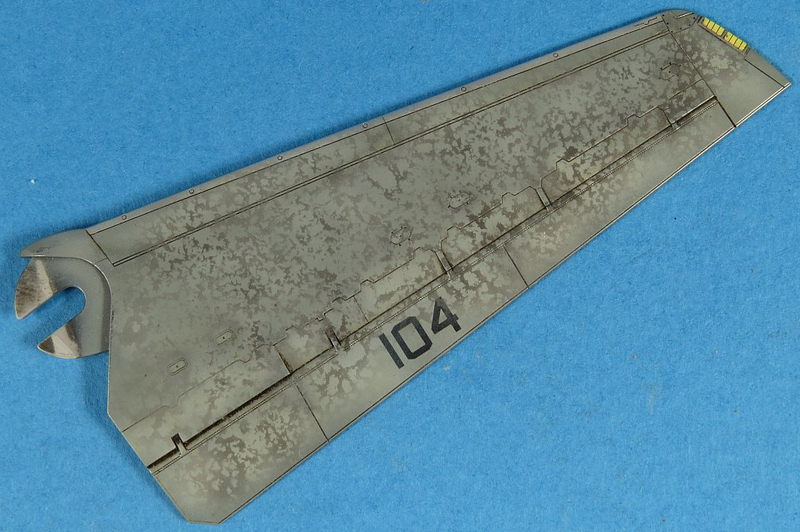 I have found that when cleaning up the wash it is often useful to have some of the grime stay on the surface adding yet another subtle layer of weathering. It is not an exact science and I normally feel my way thru each model. After an hour or so to dry I wiped off the wash with a dry paper towel. Now normally after an hour the Model Master and white spirit mix, I make myself will have dried to a point where I need some thinner to remove it cleanly. Not so the MiG Ammo wash as it was still quite 'mobile' at this stage which caught me initially off guard. Realising I did not need additional thinners to remove the excess wash I simply dropped back to using a dry cloth (and cotton buds) and I was able to get the effect I was after. 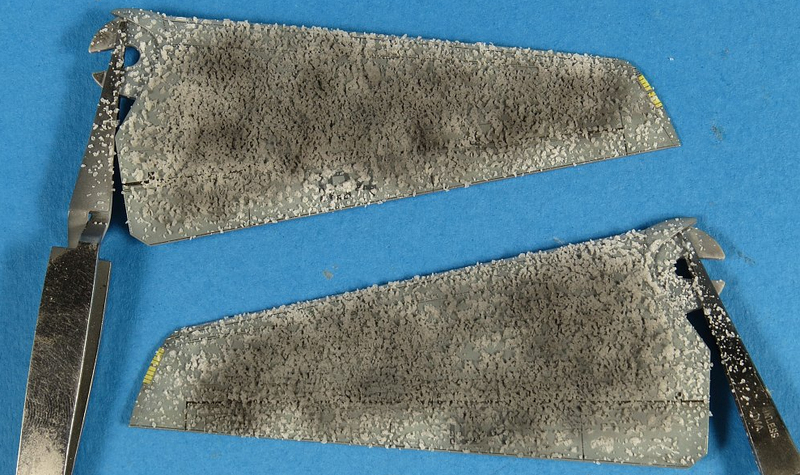 It's worth noting for completeness that if you leave the MiG Wash more than 24hrs to dry that it does go off and harden more, to the point in fact that you need some thinners to remove it. Once the panel wash is all cleaned up from the surface I did a quick test fit of the wings and tail to see how it was looking. It is important to keep bringing the separate sub-assemblies together to ensure the weathering effect is consistent across all the parts. 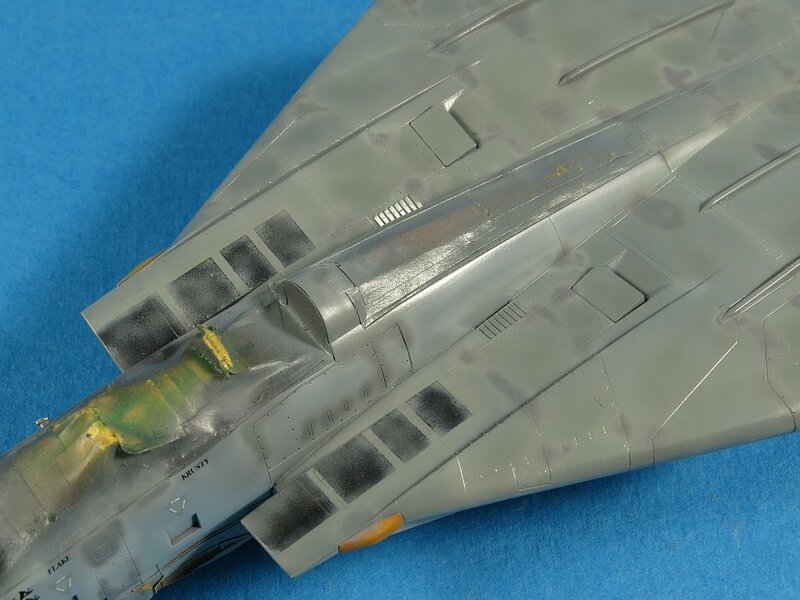 Nothing worse than having the wings way cleaner than say the fuselage as this tends to ruin the illusion of the aircraft weathering as a whole. I was very happy with how it was looking at this stage. 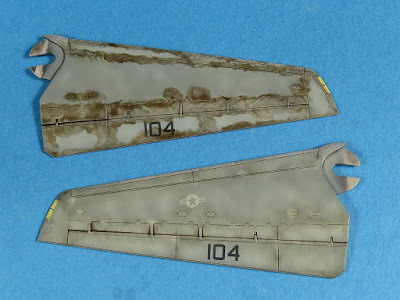 The remaining masking was removed and the wing leading edges were painted Alclad Aluminium. The undersides were looking suitably beat up but not grimy enough just yet. The second round of oil washes was yet to come. 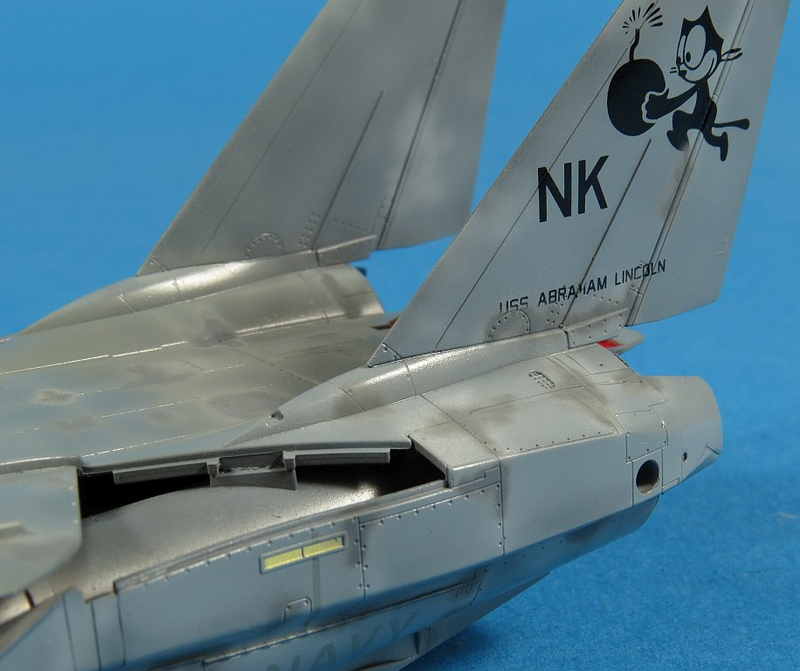 The nose required a few hand painted details including the tan coloured AN/ALR-45 Radar Warning Receiver (RWR) blister on the wing glove leading edge and the natural metal plate ahead of the gun muzzle. 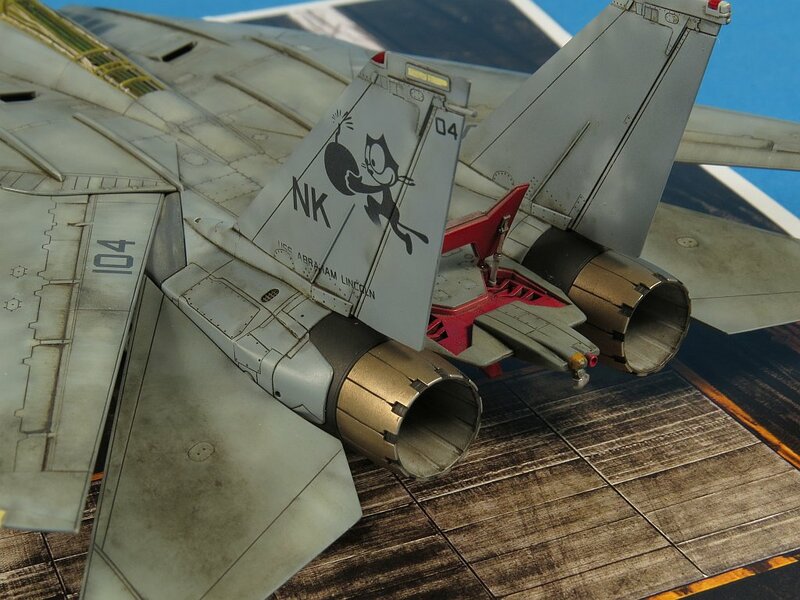 When I was studying photos of VF-31 Tomcats I noticed that the "black" markings on the wings (104) and tail (Felix) appeared quite faded (or not black at all). As the Twobobs decals were very much jet black my best option was to ever so lightly overspray them with grey, just enough to take the sting out of the black. The end result was much better and afterwards, they looked less stark and almost a very dark grey. Even though I was happy with the weathering effect to this point I wanted to try something a little new. 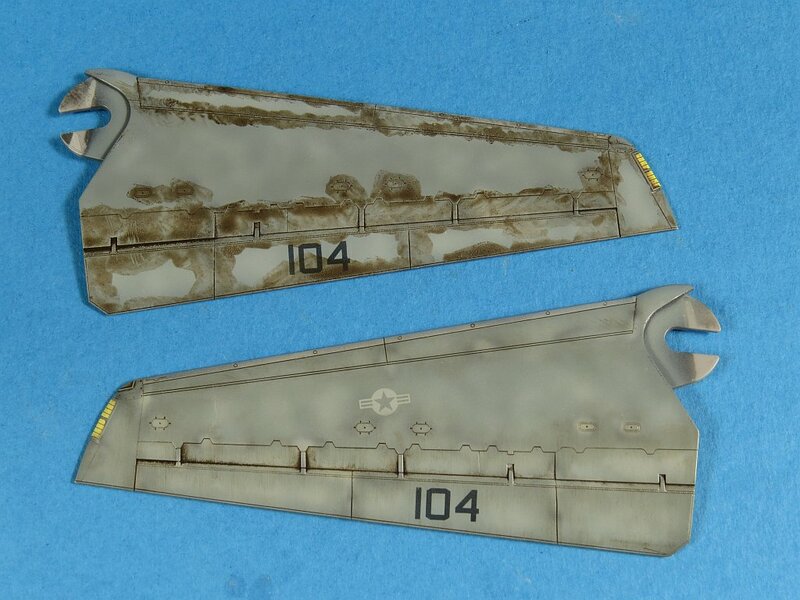 I have used the salt masking technique before for both painting chipping and random paint discoloration. 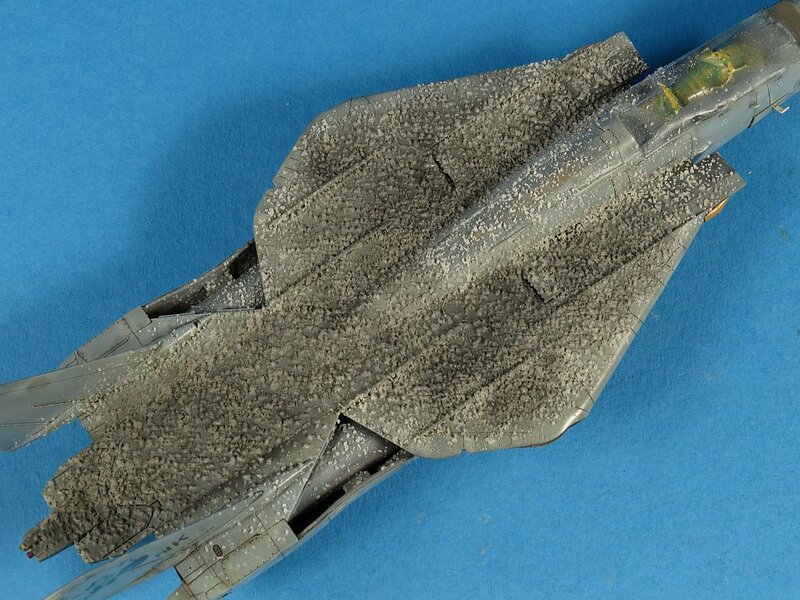 I wanted to see what that might come out like on the F-14 so out came the salt shaker. A healthy dose of salt was applied to the surface and left to dry. Once the salt was dry enough I loaded up the airbrush with a dark grey and somewhat randomly applied it over the salt mask. 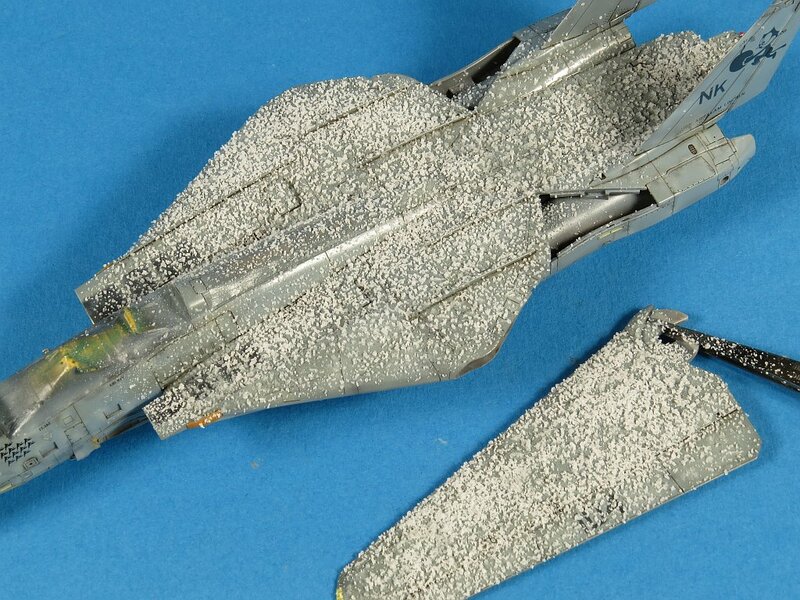 The general idea here is that the paint gets in between the salt crystals onto the models surface and gives a patchy random effect. Once the paint was dry I simply washed off the salt under a warm tap in the kitchen. The result was, well it was not what I was after at all!!! I think the problem was the grey I used was too dark (too much contrast) and I applied it too heavily. Whatever the reason I was not happy with the end result. 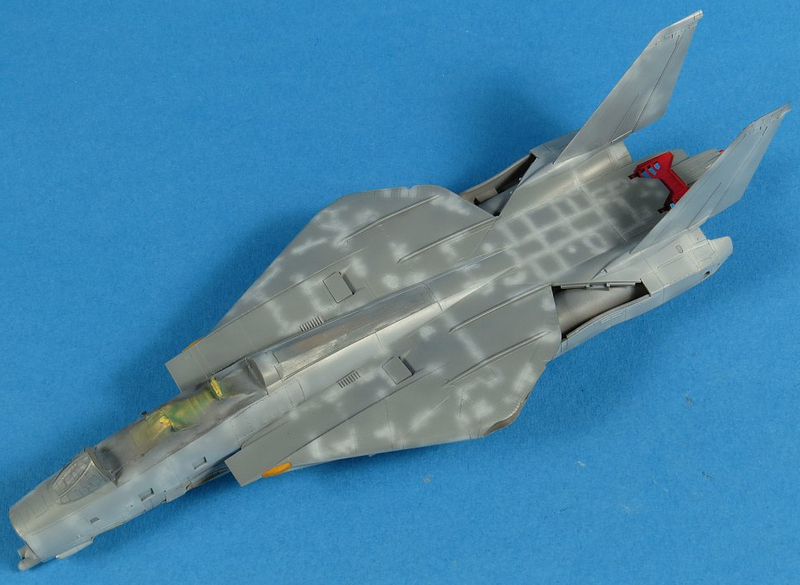 Unfortunately, the wings did not look any better than the fuselage. All was not lost, I'd learnt a few things along the way and all I had to do was wipe the enamel paint off the model with a clean cloth dipped in thinners (white spirit). Within a few minutes, it was all gone. With the failed salt coat cleaned up I was ready to move onto the flat coat followed by spot oil washes. My preferred flat is acrylic from Poly Scale (which I think you can't get anymore). It dries to a dead flat and sprays silky smooth. 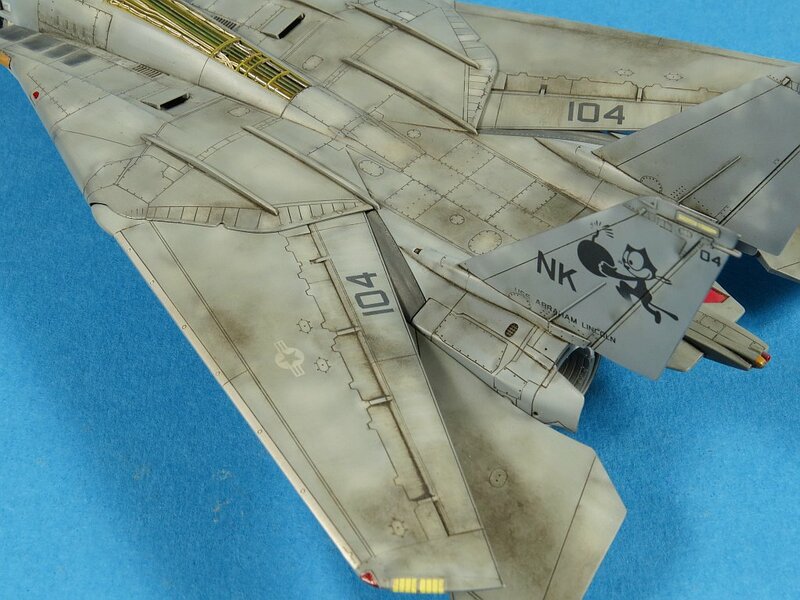 The flat coat made all that subtle shading I had layered on the wings and upper fuselage stand out now. 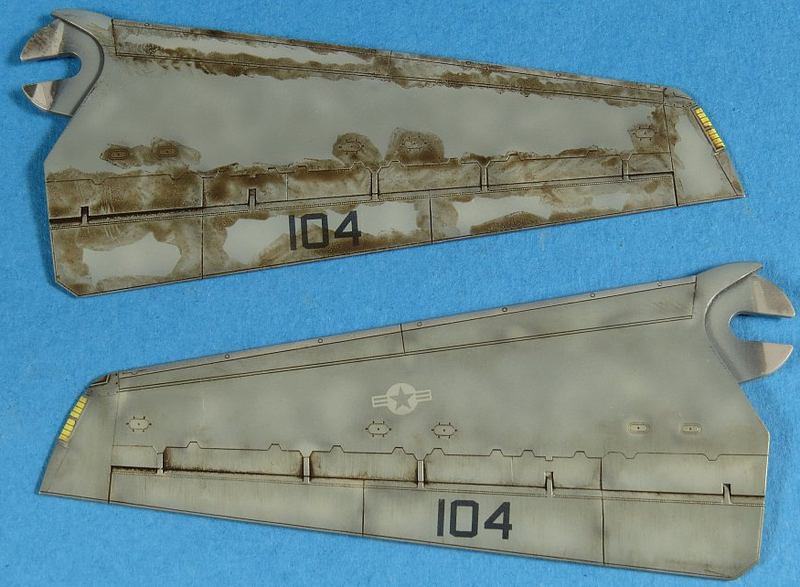 General surface grime was simulated with targeted oil washes (Raw Umber). Oil paint really is best for this step as you can blend it into the surface and keep layering it up until you get the desired effect. 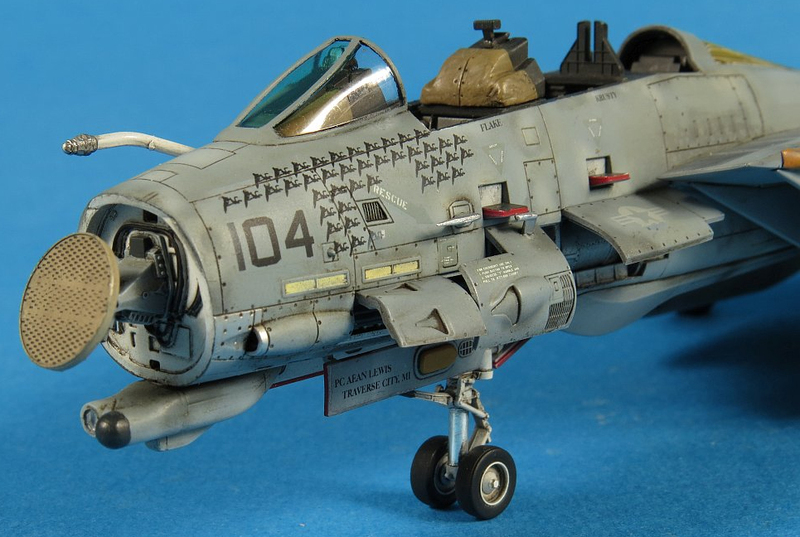 Use reference photos of the real aircraft to figure out where the dirt and oil accumulates and start there with your washes. Don't try to do it all in one step, be patient and apply thin coats letting them dry in between applications. With the painting and weathering completed it was time to remove the final masking and start to assemble the final details like ejection seats. I tend to work to a specific order when attaching all the final details. 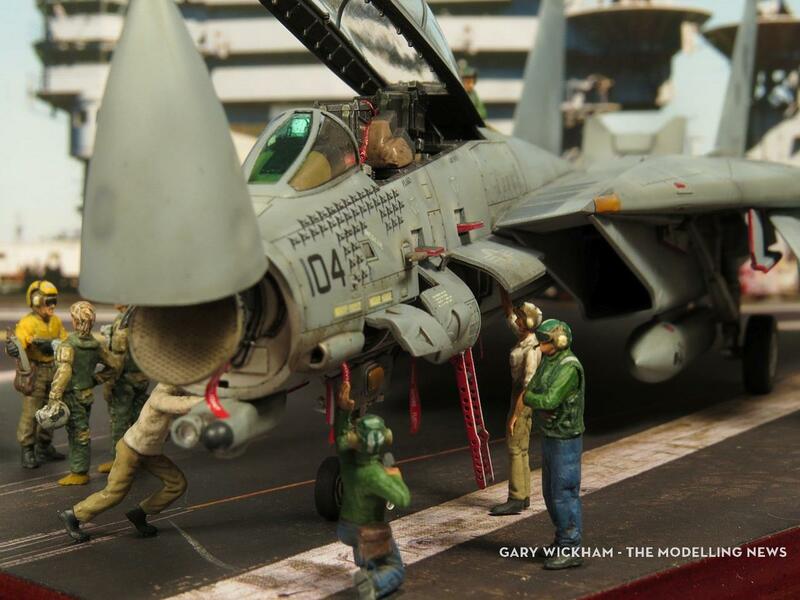 In general, I start from the middle of the model and work outwards, the logic being that I don't have to try and reach past a delicate part, later on, to attach one in an awkward place on the model. The undercarriage is normally first, followed by doors and panels, next is antennae and finally canopies etc. 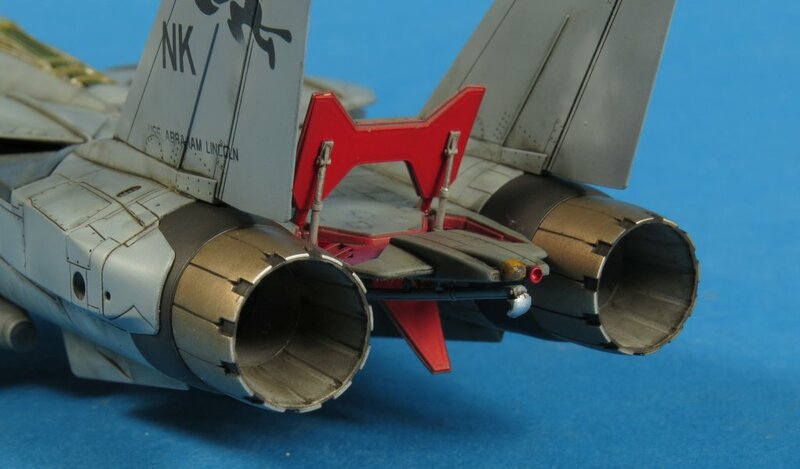 Minor details are now finalised like hand painting the red fuel dump and drybrushing some silver on the arrestor hook. The interior of the exhausts had previously received a smokey wash to simulate the staining found on the heat resistant ceramic petals. 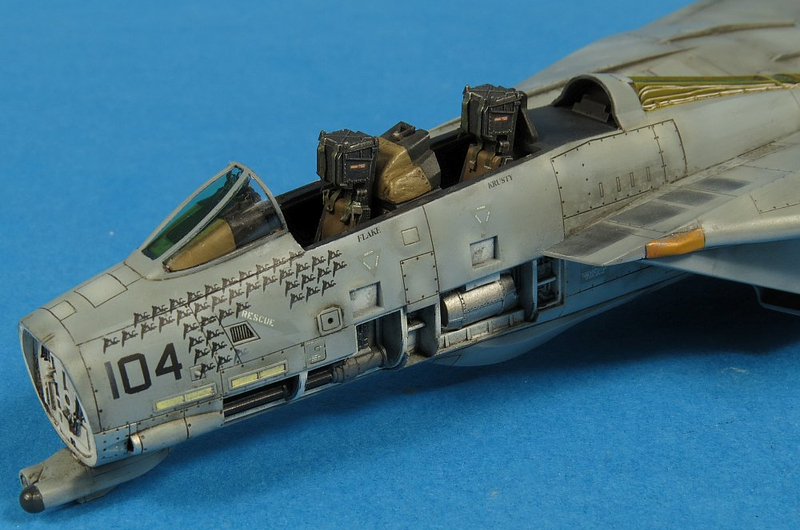 The formation "slime" lights found on all modern military aircraft were provided by FineMolds as raised framing and decals for the interior. 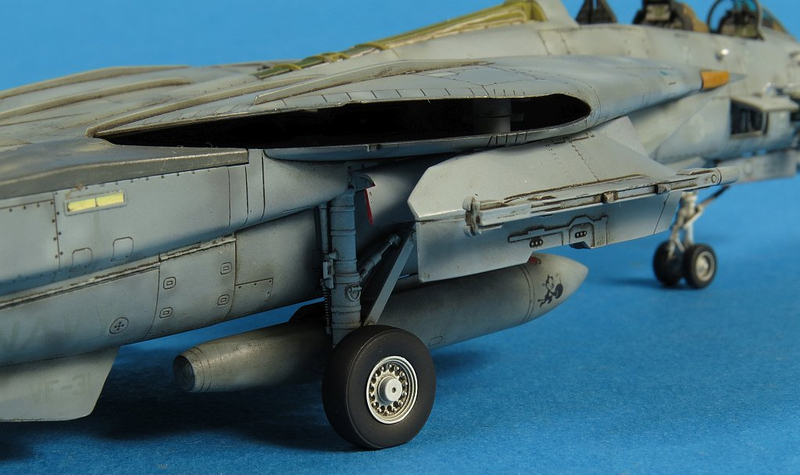 The drop tanks received extra grime washes to simulate the beating they take with fuel leaks. The white undercarriage was lightly washed with Davey's Gray oil paint as I find this works very well with light colours such as white. It does not over power the white and serves to accentuate the detail. More detail parts to be added to the starboard nose include the pitot probes, the extended refuelling probe and AN/APG-71 radar assembly. 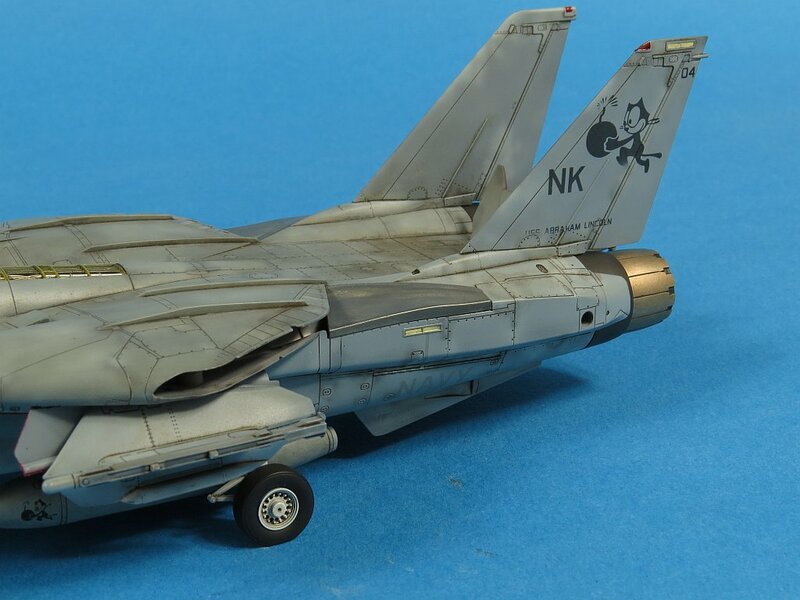 An interesting factoid about the F-14 during OIF was that the maintenance crews removed the doors on the refuelling probe bay to avoid them being damaged (or dislodged) during refuelling. The chrome finish on the nose gear strut was achieved with Bare Metal foil attached after painting. A final close up shot of the nose. 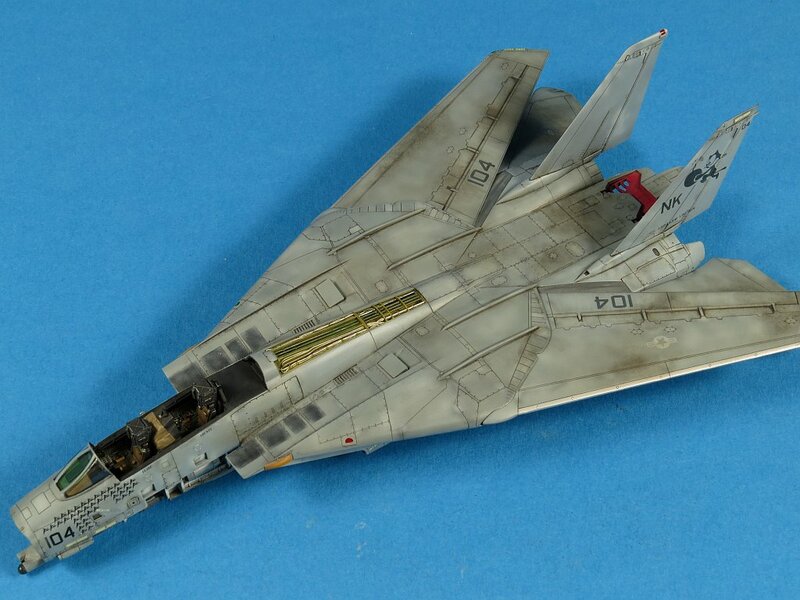 Yet to be added are the seats, canopy, boarding ladder and radome. These were all left to the very end due to their fragile nature. With everything now attached its time to take some happy snaps. 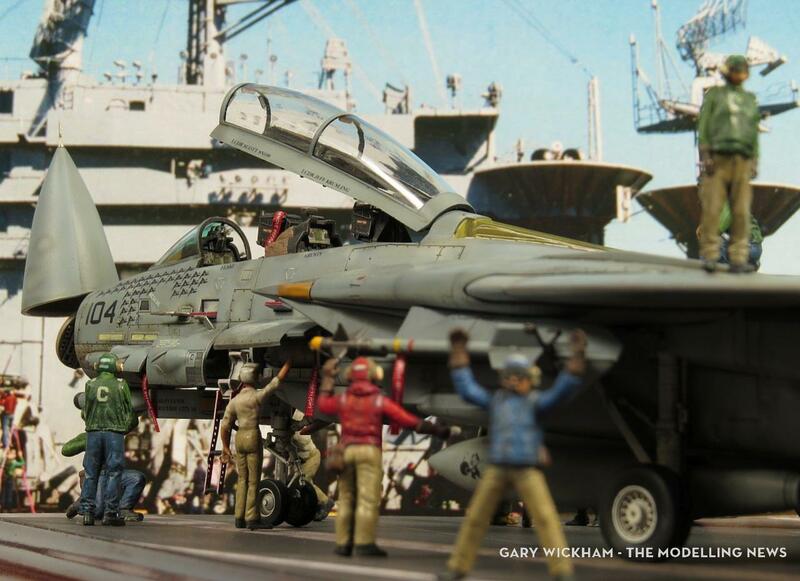 I planned to display the model on a carrier deck and had one of the excellent Ushi Van Der Rosten pre-printed handy. The RBF tag visible here on the seat is from Eduard. It's one of the new HGW inspired series of cloth tags. These are truly excellent because you can bend and twist them to look and behave just like the real thing, so much better than PE alternatives. It's amazing how much a good base adds to a model. 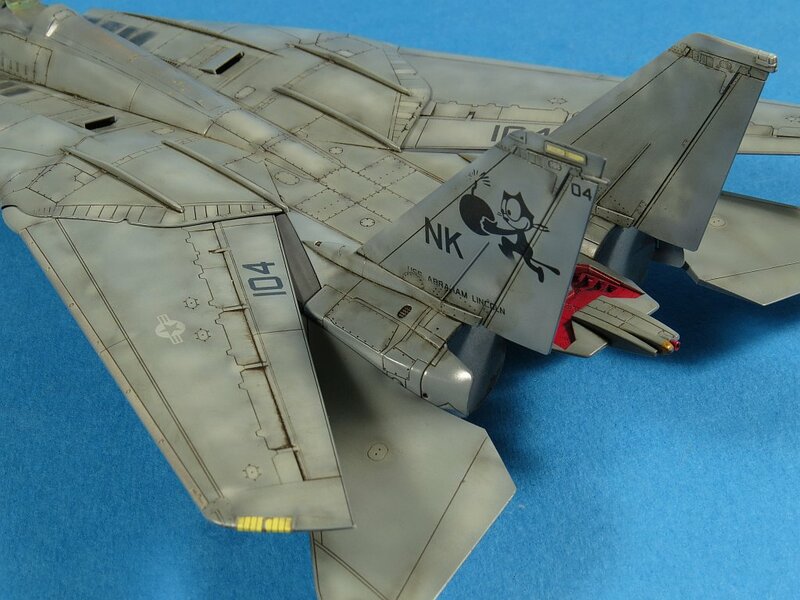 The F-14 parked over a catapult blast deflector looks so much more realistic than it just sitting on a plain coloured base. In the end, I decided to add the two sidewinders to the shoulder pylons with some scratch built sensor covers. 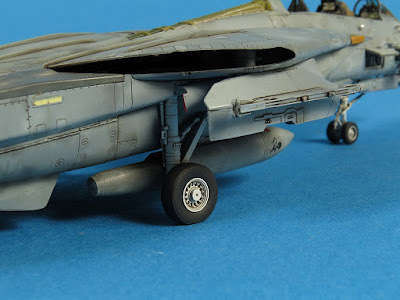 The AIM-9L/M provided in the FineMolds weapons sprue were nicely detailed and painted up well. 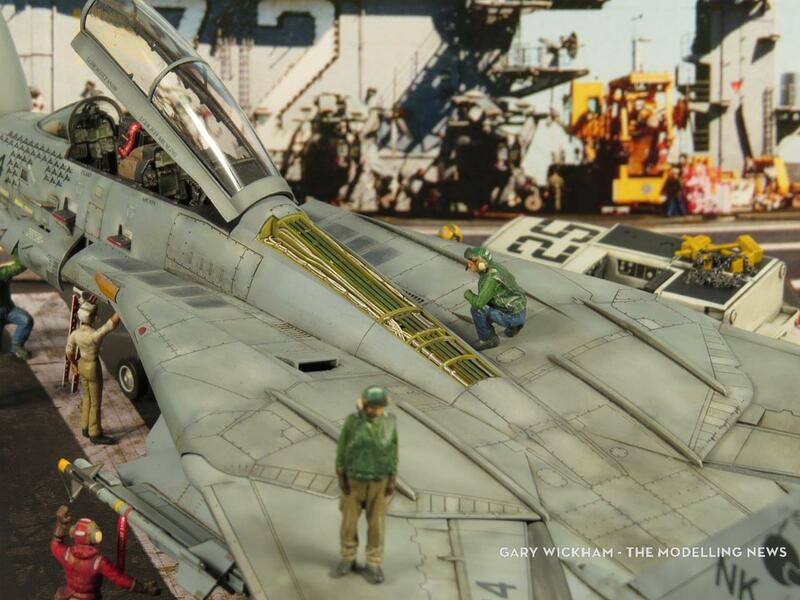 The only thing missing from the model now was some deck crew figures and pilots. To finish off this build report I'll leave you with a few photos of the end result. 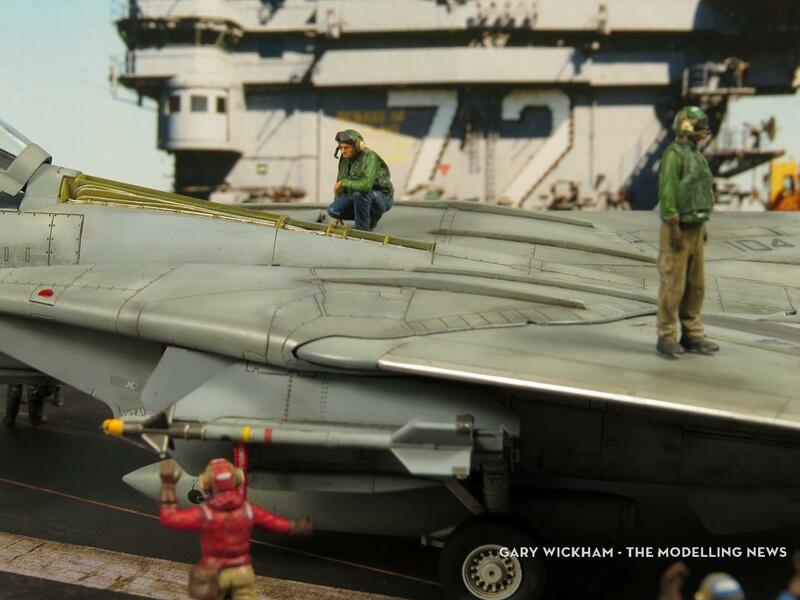 I downloaded an image from the internet I found of the real USS Abraham Lincoln flight deck and with some careful camera positioning and image cropping I think it makes for an interesting (realistic?) background. I would have preferred at least a couple of options for the decals (maybe one lo-viz and one hi-viz) but in the end, the TwoBobs sheet provided what I was after. I will certainly be purchasing more of the ReedOak and ModelKasten figures for my upcoming builds. Overall I'd give this kit a 9/10 and recommend it without hesitation. 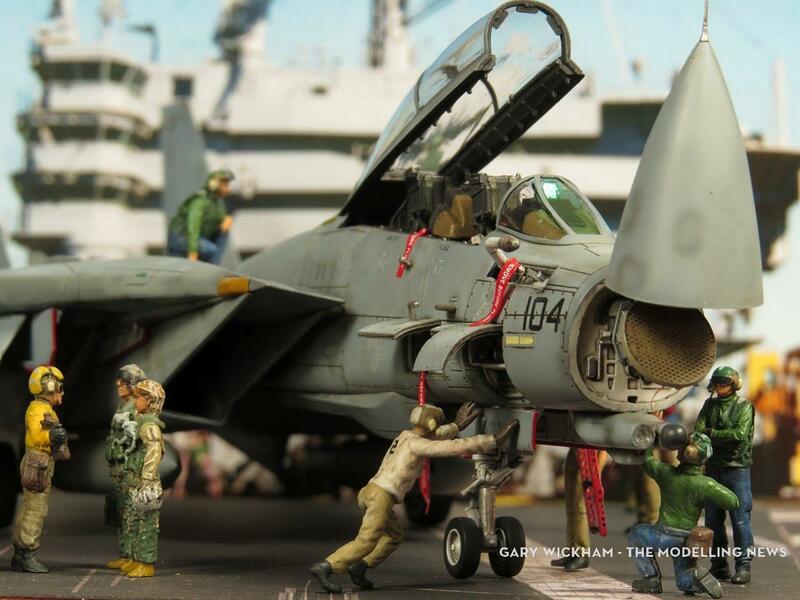 See more of Gary's wonderful builds on his Facebook Page and his Scalespot Website.